We are excited to announce that New York Bride & Groom of Raleigh is now carrying a brand new line of phenomenal and affordable wedding dresses. The label is Rebecca Ingram, a new value-priced division of Maggie Sottero, so you know you are in for awe-inspiring style and immaculate detailing. If you want to look like a million bucks on your wedding day without being forced to spend that much for the privilege, New York Bride & Groom truly is your ultimate destination for inspired designs and popular pricing. In fact, now more than ever. The dresses in the Olivia Collection cost around $1000 for all the glamour and sophistication you could hope for. Our expert Bridal Consultants can help you fulfill your wedding dress dreams while helping you stay on budget. Our over-the-moon response to the launch of Rebecca Ingram is the exact response the designers behind the line were aiming for with these beautiful yet affordable gowns. Here’s what the president of the parent company had to say about the new label. 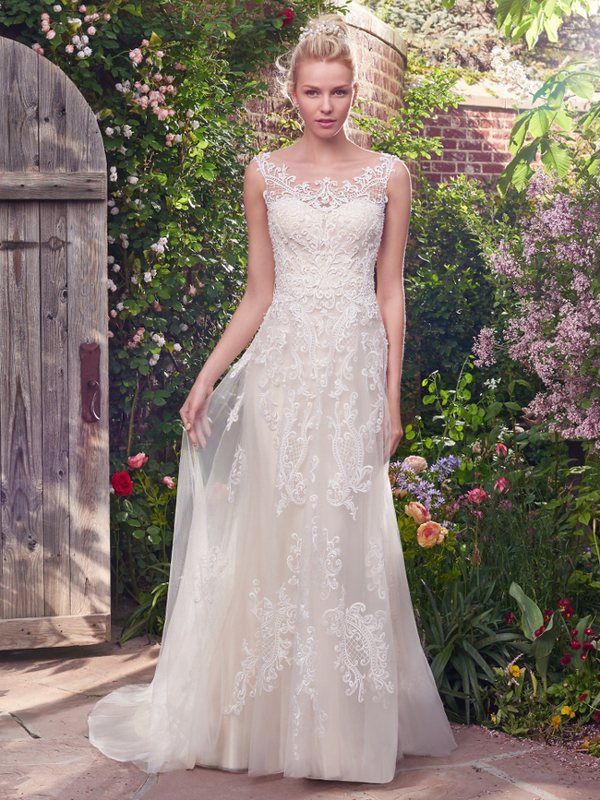 Rebecca Ingram, style PIPER: This simple sheath, lace wedding dress evokes grace and charm. It features a classic V-neckline, illusion straps, and illusion back accented in lace motifs. The gown is finished with covered buttons over a zipper closure. Available in sizes 0-28. Available colors: White, Ivory, Ivory over Light Gold (pictured). Check out the glowing radiance of these gorgeous wedding gowns. Ivory over light gold works beautifully with multiple skin tones and offers a welcome option from the more traditional wedding dress shades. We are simply ecstatic to show you the craftsmanship and gorgeous detailing on these wedding dresses. Our entire staff is in love with the sweet “Alexis” dress pictured above. It’s probably our favorite from the Olivia Collection, but with so many exquisite gowns to choose from it’s difficult to make a definitive selection. Rebecca Ingram, style ALEXIS: This flirty A-line gown features distinctive crosshatch motifs embellished with Swarovski crystals, delicate beading, and sequins. 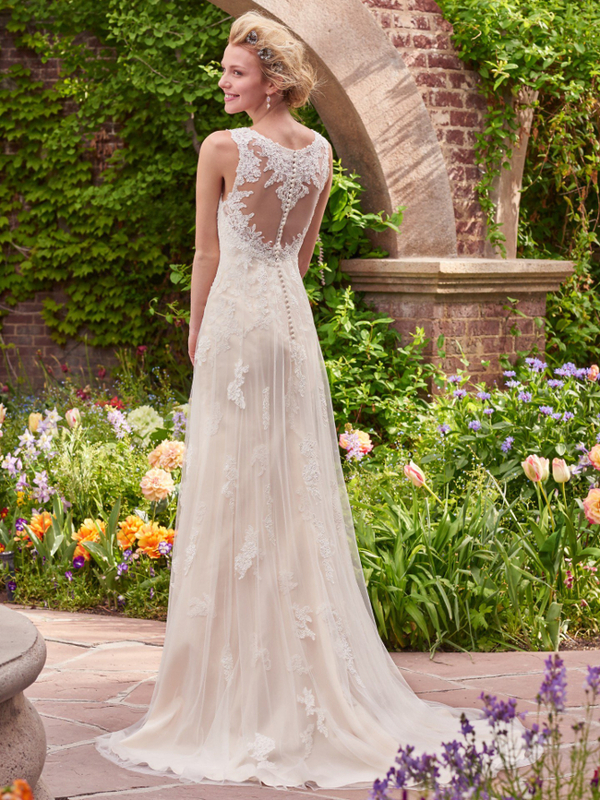 Illusion details accented in lace appliqués create beautiful back interest. The dress is finished with covered buttons over a zipper closure. Available in sizes 0-28. Available colors: White, Ivory, Ivory over Light Gold (pictured). We’d love to see which Rebecca Ingram wedding dress is perfect for you. Stop by any time that is convenient and try on dresses. Remember, no appointment is ever necessary to shop New York Bride & Groom. And don’t forget to bring your camera for photos to review later. As you can tell, we pride ourselves on being different from the competition. It’s what makes us the premier bridal salon in the Triangle and beyond. We look forward to serving you soon.